The Riverside Concrete Sail House by LUXUS Homes and Tim Wright Architect explores the many possibilities of concrete as a material. Using it to inspiring and sometimes surprising effect, this home was adventurously designed in collaboration with ambitious clients. Using words and phrases like "over the top", "dramatic", and "beautiful", Tim Wright's passion for the project, five years in the making, is clear. 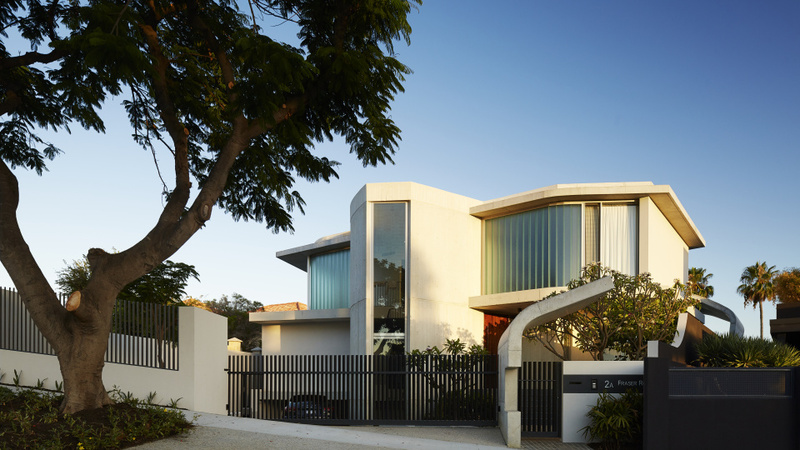 The clients for the Riverside Concrete Sail project approached LUXUS Homes and Tim Wright Architect to design and subsequently build a "concrete yacht" by the riverside in the Perth suburb of Applecross. The project proved a challenging yet rewarding experience for the architect and master builder, who felt blessed to work with daring and trusting clients to create something extraordinary. "Working with someone who trusts you is really rewarding because you can try different things out," Tim says. "They fully back your vision, then together we see it built and realised. We love that." LUXUS Homes and Tim Wright Architect are a Perth-based collaboration led by master builder Russell Manager and architect, Tim Wright. They operate as a collective team along with director Jarrad Cranston, committed to listening to each idea presented, regardless of experience. While Tim may set the architectural direction, Jarrad explains "no one has a mortgage on good ideas", adding "just because you're a builder doesn't mean you can't contribute to the design process in a meaningful way. There's not one person who draws and then another who is the builder; it's much more open than that. We try to get our projects through everybody’s hands." The emphasis placed on planning and open discussion certainly filter through to every level of the practice's design, contributing to their excitement about unusual projects like the Riverside Concrete Sail House. The entire premise of a concrete house is polarising, to say the least, with concrete's powerful materiality eliciting strong reactions; both for and against. The clients' love of the material's tactility and strength led them to request using it in as many forms as possible. 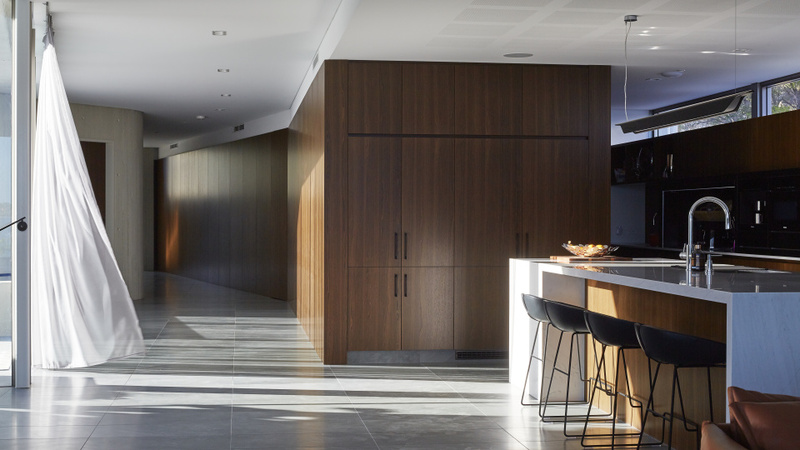 LUXUS Homes and Tim Wright chose to work with the concrete's dramatic qualities, enhancing them in some places, contrasting with them in others, and delighting in exploring its diverse potential. With the intention to provoke different emotions in each space of the home, the Riverside Concrete Sail House takes the inhabitant on a journey, from an experience of austerity through to a composed serenity. "You start in that triple height entry void, and the acoustics are quite resonant", explains Jarrad. "Then you reach the timber cladding and acoustic ceilings in the living. The whole sound of the space changes and it becomes really quiet and soft, which is very unexpected for people because they just see the concrete and think it must be very intense the whole way through," he says. The flow from the spacious triple-height concrete walls in the entry to the acoustic-lined ceilings throughout the kitchen and living on the ground level enhances this notion of zoned spaces. Minimal in aesthetic, the open plan living, dining and kitchen is never the less rich in materials and textures. 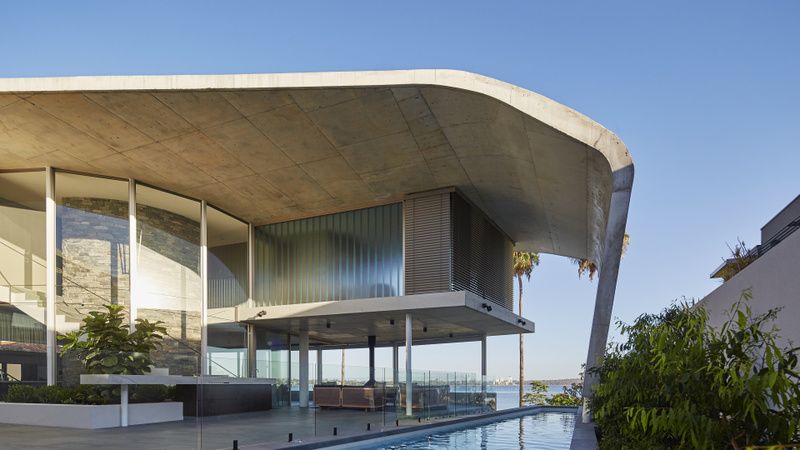 The hero of the Riverside Concrete Sail House is undoubtedly the grey, off-form concrete sail that extends boldly down from the roof to reside on three small columns cast into the edge of the 20m long lap cantilevered pool and spa. Adjacent white Oregon boarded off-form concrete pond and the elongated barbecue and bar complete the entertaining area creating a durable yet elegant space. 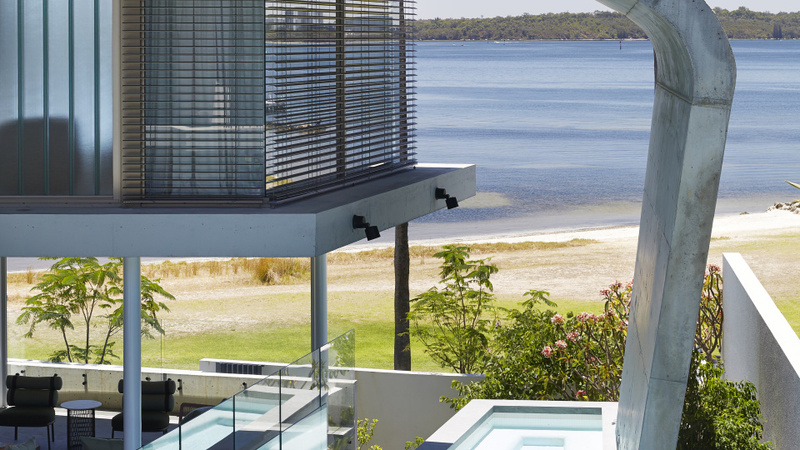 "The clients are in shipping, and the use of the sail and the cantilevered pool perfectly reflect their buoyant industry and desire for entertaining while at home," Jarrad says. 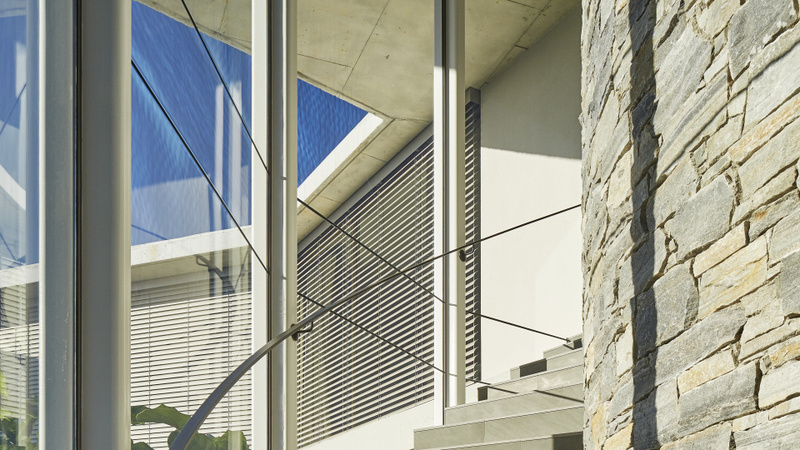 The northern full-height windows, which allow a view of the river throughout the majority of the home, are just one element of the considered and consistent detailing which executed the clients' brief. Honed Bedonia stone cover the ground from and light and exquisite Aurelius stone adorns the benchtops and island. Accented with bronze smoked mirror splashbacks, chrome tapware and complemented by Havana veneer and matte black cabinetry, the stone exudes understated luxury. 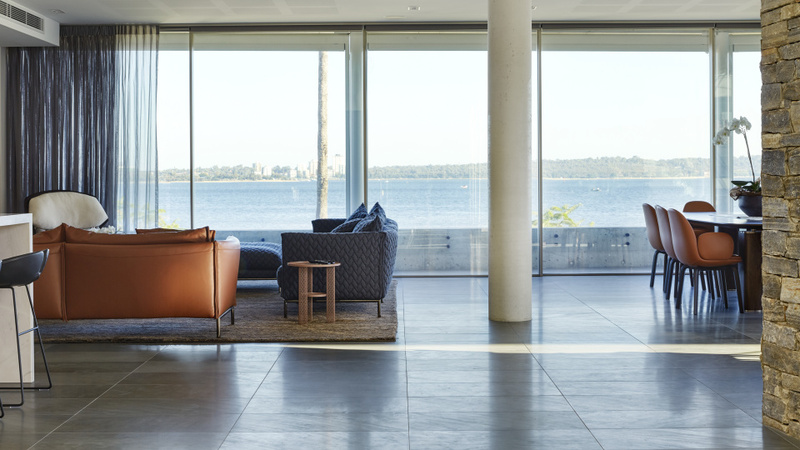 While by no means a modest home, the interior design and finish selection in the Riverside Concrete Sail House is elegant and meticulously controlled, focusing on celebrating the beauty in the simplicity of fine materials, rather than on gaudy embellishment. The finesse of the interior design continues upstairs. As intended, the feel of the upper level is remarkably different from the lower ground. Noticeably lighter, the bedrooms are effortlessly charming and understated. As Jarrad explains, the rooms were the perfect fit for the clients' adolescent boys. "We went big and expansive in the living areas downstairs; up here it's all under control. It's certainly luxurious but still restrained," he adds. The main ensuite, however, wrapped in the grandeur of the Aurelius quartzite and the Bedonia stone, embraces some of the more expansive qualities of downstairs. A uniquely shaped, deep walnut veneer bath and beautiful yet minimalist tapware compliments the colour palette without taking any focus away from the unparalleled view. Using the initial brief for a "concrete yacht" as a launching point from which to explore the vast potential of concrete, LUXUS Homes and Tim Wright Architect has achieved this initial goal and much more. 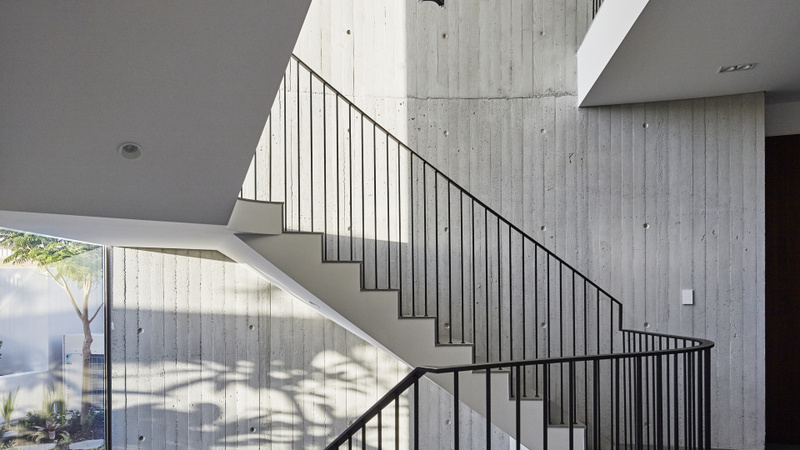 In the Riverside Concrete Sail House, they have created spaces that evoke an emotional response as one moves through them, challenging the austere connotations associated with concrete and constructing a lively home that surprises at every turn. LUXUS Homes is one of Perth's finest luxury home builders specialising in architectural homes across Perth and the metropolitan region. Luxus Homes are focused on delivering an award-winning finish to all of their homes while maintaining a professional and attentive client relationship before, during and after the construction period. To find out how you can build your architecturally designed luxury custom dream home, visit www.luxushomes.com.au.